This patch for Cycling '74's Max activates several functions on the Push's LCD, including labels for the knobs, visual feedback of the knob's values, loop and move lengths, track position, and track and artist names for Decks A and B. 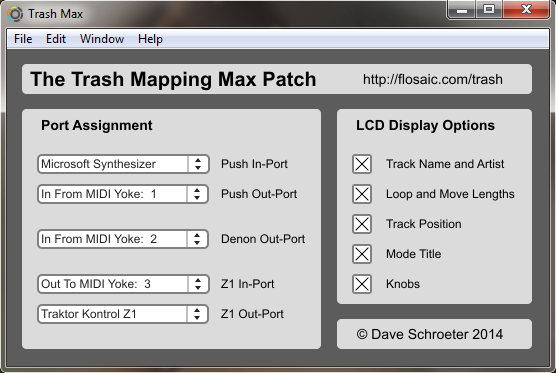 It also syncs the custom Kontrol Z1 mapping with the main mapping so the Z1's knobs 'follow' the main mode. The port labels ('Push In-Port', 'Denon Out-Port') above correspond to the port names in Traktor. The various display secions can be toggled on and off here. Refer to the installation instructions for info on how to get this patch working.